Dili 4 July 2016. Prime Minister H.E. Dr. Rui Maria de Araújo was presented with the World No Tobacco Day Award today by the World Health Organization. Attended by the Minister of Health Dr. Maria do Céu Sarmento Pina da Costa, Regional Director for South-East Asia Region at the World Health Organization, Dr. Poonam Khetrapal Singh, and other members of government. Nominated by Health Alliance International, the award recognizes Prime Minister Dr. Rui Maria de Araújo’s efforts to bring attention to this major public health issue in Timor-Leste. 70% of adult men smoke in Timor-Leste, which affects more than the smoker’s themselves. Secondhand smoke can be especially harmful to pregnant women, babies and children whose lungs are still developing. As the Head of State, the Prime Minister has demonstrated his commitment through involvement in a mass media campaign, participation in a national advocacy workshop, and support to tobacco control legislation and cigarette advertising and packaging regulation. Speaking at the Ministry of Health in Caicoli ‘I am a former smoker. I am first and foremost a medical doctor and then a politician. I realized that smoking was killing me. I realized it was stupid. I took charge over my own health and I quit. It is not easy to stop smoking and yet it is possible and we can quit for good’ said the Prime Minister Dr. Rui Maria de Araújo. Dili 4 Jullhu 2016. Primeiru Ministeru H.E. Dr. Rui Maria de Araújo simu premiu ba Dia Mundial sem Tabaco husi Organizasaun Mundial ba Saúde. Ministra da Saúde Dra. Maria do Céu Sarmento Pina da Costa, Diretora Regional Organizasaun Mundial ba Saúde Sudeste Asiatico, Dra. Poonam Khetrapal Singh no asiste husi membru governu seluk. 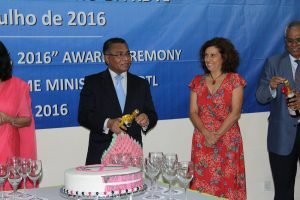 Nomeia husi Health Alliance Internatonal, premiu rekonese Sua Excelensia Primeiru Ministru Dr. Rui Maria de Araújo nia servisu tau prioridade ba issue saúde publiku ida ne’e iha Timor-Leste. 70% husi mane adultu fuma iha Timor-Leste, nebe mos afeita ema seluk. Sigaru suar husi ema seluk perigu liu ba inan isin rua, bebe, no labarik sira nebe sira nia pulmaun sei dezenvolve hela. Hanesa xefi ba Estadu, Primeiru Ministru hatudu nia komitmentu liu husi nia involvementu iha kampanyã anti tabaco, partisipasaun iha workshop advokasia, no suporta ba lei konaba kontrola tabaco no regras ba promosaun ba pakote sigaru nian. Koalia hela iha Ministerio da Saúde iha Caicoli, ‘Hau uluk fuma. Hanesan ita bo’ot sira hatene katak hau doutor no politiko nain. Hau foin hatene katak fuma sigaru mak oho hela hau. Hau iha konsiensia katak ne’e buat beik ida. Hau foti initiativu rasik ba hau nia saúde no para. Atu para fuma sigaru laos buat fasil maibe ita bele para’ hateten Primeiru Dr. Rui Maria de Araújo. Sra. Che Katz, Direitora ba Health Alliance International iha Timor-Lesste hateten, “ Ami kontenti los katak Sua Excelensia Primeiru Ministru hetan premiu ba anti-tabaco iha Timor, nebe sei iha impaktu postivu ba saude inan no oan. Bainhira inan isin rua horon ema seluk nia sigaru suar, ne’e bele afeita ba bebe nia fuan, pulmaun, sistema digestaun no saraf pusat. Health Alliance International iha komitmentu boot kontinua servisu ho governu iha Timor atu minimiza sigaru suar nebe inan no oan sira horon. Health Alliance International (HAI) is recognized globally as an organization that combines a service and solidarity ethic with the critical thinking and rigor of its academic base. 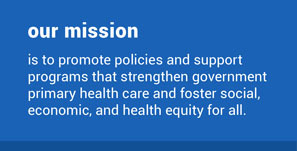 For over 25 years, HAI has provided substantial support to its government partners to strengthen public sector primary health care. Operating in Timor-Leste since 1999, HAI provides valued support to the Ministry of Health’s maternal/newborn care and family planning programs. Health Alliance International (HAI) rekoñese globalmente hanesan organizasaun ida ne’ebé kombina étika servisu no solidariedade ho hanoin ne’ebé krítiku ho rigor no baze akademia. Tinan 25 liu ona, HAI fo ona suporta signifikante ba parseiru governu hodi hametin setór kuidadu saúde primariu ba públiku. HAI komesa halo servisu desde tinan 1999 iha Timor-Leste hodi fo suporta ne’ebé importante tebes ba Ministériu da Saúde ba kuidadu saúde inan no bebe no programa planeamentu familiar.